The story is told of a rather self-important man who made it his mission to visit the Sunday school classes in his church each week. Often teachers were a little intimidated by him sitting there in silent judgment. No one answered. Nobody moved. And finally one small hand worked its way hesitantly above a young head. He pointed expectantly toward the girl. “Why do you suppose people call me a Christian?” he asked her. We call ourselves Christians, not because we do not have a name; but because we are baptized into Jesus’ death and resurrection. To be baptized into Jesus’ death and resurrection means that we embrace Jesus’ teachings and Jesus’ way of life. It is not enough to define our Christian identity by baptism, by profession of faith, by associating ourselves with a Christian denomination or churches, by going to church, by receiving the Holy Eucharist or by reading the Bible etc. St. Paul reminds the Corinthians that their ancestors did all of those things. They all followed the cloud, crossing the sea, baptized into Moses in the cloud and in the sea. They all ate the same spiritual food and drank the same spiritual drink. Yet God was not pleased with them. They were among the people of God but they grumbled. They allowed themselves to be distracted by foreign gods. As Christians, it is important for us to be faithful to the God who calls us into a life of communion with Him through his Son. God is a faithful God; and He expects his people to be faithful to Him as well. To be faithful to God means to keep our relationship with God alive, to constantly engage ourselves in conversation with God. Like Moses, it is important for us to show reverence in the presence of God at church. The church building is not a civic building. It is also not a hall. It is a special place designated for worship. The church building is the holy ground where we encounter God as a community of believers. In the Catholic Church, we also celebrate the Holy Sacrifice of the Eucharist. It is where Christ is made presence sacramentally. It is also where we listen to the words of God together as a community. After a whole week working and living in the world, we come to church to listen to the words of God. The words of God remind us of our only True God, and there are no others. Living in the world, we are exposed to many different philosophies and beliefs. Our Christian faith and beliefs might easily be tainted by wrong theologies as well. On January 2010, the earthquake killed almost 200,000 people in Port-Au_Prince, Haiti. And on February another earthquake in Chile killed almost 1,000 people. Many people wonder why God let it happen. Is God punishing the people of Haiti and Chile? Are they more of sinners than others? If you are asking these same questions, you are not different from some of the people of Jesus’ time. These are just a couple of the more spectacular of a whole series of tragic and painful events which occur daily, which trouble our hearts and create questions in our minds. The Desarmes family left their native Haiti two weeks after the devastating earthquake, joining the eldest son in Chile for what seemed a refuge from the fear and chaos of Port-au-Prince. Their sense of security was shattered at 3:45 a.m. that Saturday when a powerful quake shook Chile killing almost 1000 people. All the Sesarmes survived both quakes. They do not think that they are better than others. They just wonder why they are spared! 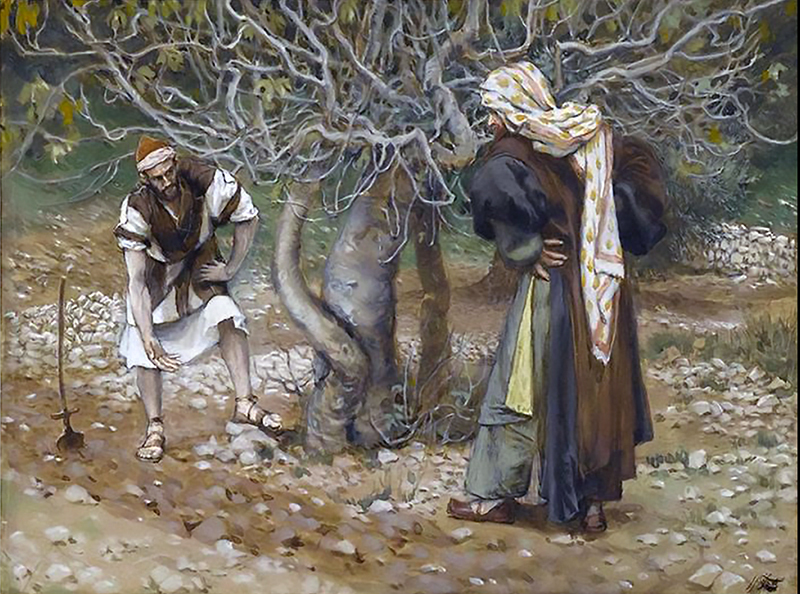 Some people approached Jesus and asked his opinion about two incidents which raised the same questions. One took place at the temple in Jerusalem, when Pilate ordered some Galileans killed while they were in the act of making animal sacrifices to God; the blood of those devout worshipers became mingled with the blood of the animals. Jesus is calling us to repent, to follow His way of life. He is the only way leading us to the Father. Jesus is a Servant of God; we should be servants to God and to one another. Jesus comes into the world in obedience to God and doing God’s will. We should be obedience to God and doing God’s will in the world as well. Jesus is compassionate. He loves the poor, feed the hungry, and cures the sick. He defends and forgives sinners. We should do the same. Every one of us is like a fig tree. We are Christian Fig Tree. We should produce Christian Fig Fruits. God is expecting us to be productive Christian Fig Trees.